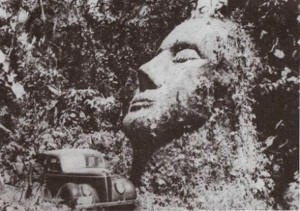 In South Guatemala this picture of an incredible giant head was taken more than 50 years ago and is above 5 meters high! The most striking feature is that the face shapes are absolutely not close to any South American traits. Some people claim this statue belonged to the Olmec. But it will take you 3 seconds to look for an Olmec head statue picture and see they are nothig alike. Only 2 possible explanations: caucasian looking people occupied this part of the world at some point. Local people have been in touch with caucasian looking people before this was erected. Forgotten until the late 1980’s, recent trips managed to locate the stone. Unfortunately it is located in a zone where rebels are still active and the stone is now completely destroyed. Nose, mouth and the rest are almost unrecognizable. Meaning that no scientific expedition will ever be able to go there and study the giant head in its original aspect. 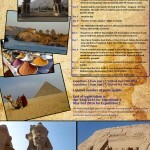 History will progressively forget about this amazing discovery and the truth will forever disappear. When was this built? Why? Is it just a head? 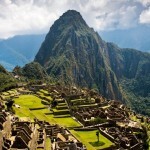 Or like Easter Island a humongous body is buried underground?